The Pro - The Pro Series is our premier series of stands featuring our innovative lift spring for automatic setup. The Pro Stand is compact and can fold and attach to your case or be stored away in seconds. 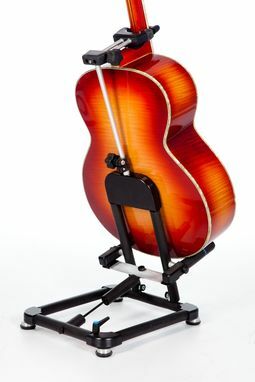 The Pro Stand is fully adjustable and can accommodate all string instruments. The bottom, back and neck of your instrument are all supported simultaneously. Additional security for your instrument is provided via push button. Your best instruments are secure and belong in The Corrado Pro Stand. Materials Used: Composite, padding & solid aluminum. For musicians who want the best support and quality for their instrument.